Washington - October 25, 2013 - The 2013 Washington International Horse Show (WIHS) continued on Thursday with the first day of classes for the Junior Hunters and several International Open Jumper and Junior/Amateur-Owner Jumper classes at Verizon Center in Washington, D.C. The International Open Jumpers had two classes with a win for Kent Farrington (USA) and Robin Parksy's Blue Angel in the $33,000 International Open Jumper Welcome Stake. Top honors in the $20,000 Gambler's Choice costume class went to Shane Sweetnam (IRL) and Sweet Oak Farm's Solerina. The Junior/Amateur-Owner Jumpers competed as well with a win for Cloe Hymowitz and Rose Hill Farm's Bon Vivant in the Low division and Charlotte Jacobs aboard Deeridge Farms' Kachina in the High division. WIHS continues through Sunday, October 27, with lots of exciting action throughout the weekend. Highlights include the $25,000 Puissance sponsored by The Boeing Company on Friday, October 25, and the $125,000 President's Cup Grand Prix, a FEI World Cup qualifier presented by Events DC, on Saturday, October 26. All evening performances will begin at 7 p.m. EST.In addition to the competition, Thursday was the always popular "Barn Night,” presented by Dover Saddlery. Barn Night at WIHS is a favorite with local young riders and horse enthusiasts who attend in groups and have a chance to enter contests, win big prizes, and enjoy a fun, horse-filled evening. Olympic course designer Leopoldo Palacios of Venezuela is the course designer for the jumpers this week at WIHS. In the day's $33,000 Welcome Stake, Palacios saw 30 entries contest his first round course with ten advancing to the jump-off. Eight of those were also clear over the short course, and Kent Farrington and the 11-year-old Anglo European mare Blue Angel (by Luidam) raced to victory in 31.38 seconds to win The Ben O’Meara Memorial Challenge Trophy. Beezie Madden (USA) and Coral Reef Ranch's Coral Reef Via Volo finished second with a time of 31.47 seconds. Nicola Philippaerts (BEL) and Ludo Philippaerts' Cortez placed third in 32.49 seconds, and Darragh Kenny (IRL) and Postage Stamp Farm LLC's Prof de la Roque were fourth in 32.57 seconds. 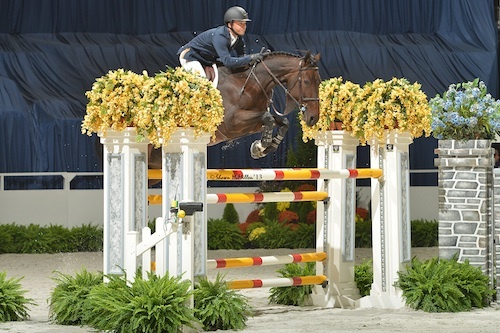 Farrington has been competing at WIHS for many years, winning the WIHS Equitation Finals as a junior in 1999, and continuing on into his professional career. He explained that the atmosphere and environment of showing indoors makes this an exciting competition each year. Blue Angel is the only horse Farrington will show this week and he plans to now save her for Saturday night's $125,000 President's Cup Grand Prix. He looks forward to seeing what Palacios has planned on course. The $20,000 International Open Jumper Gambler’s Choice Costume Class is always an exciting event at WIHS, especially with Barn Night and thousands of young fans cheering on the riders. In tonight’s class, Irish rider Shane Sweetnam jumped to victory dressed as a keg of beer riding Sweet Oak Farm's Solerina. The duo earned 960 points over the course and jumped clean over the Joker fence for an additional 200 points. Their 1160 total was the winning score. For his victory, Sweetnam was presented with the Crown Royal Trophy, donated by Crown Royal, as the winning rider. 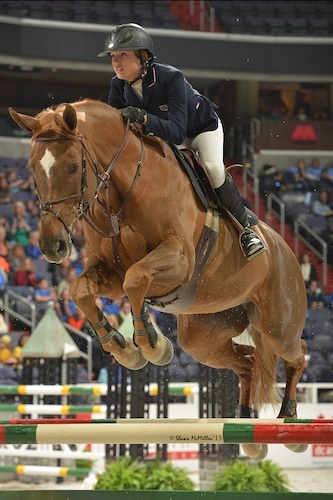 Solerina, a 14-year-old Irish Sport Horse mare by Cruising, won The Sue Ann Geisler Memorial Trophy, donated by the Washington International Horse Show, as the winning horse. Beezie Madden (USA) dressed as her signature bumble bee riding Abigail Wexner's Vanilla and scored 1100 points to place second. Spiderman, a.k.a. Conor Swail (IRL), and Susan Grange's Ariana finished third with 1090 points. “Dr.” McLain Ward (USA) and Wings had the same 1090 total and a slower time placed them in fourth. 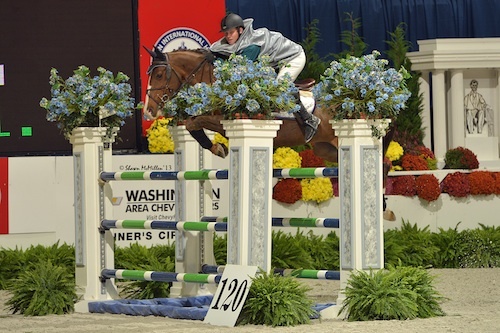 Shane Sweetnam has a good record with Gambler's Choice classes, finishing third in the class at WIHS two times and winning one in Harrisburg last year as well as placing in several others. He came up with a good plan tonight, and it paid off. The Low Junior/Amateur-Owner Jumper jump-off class, sponsored by North Star, was held on Thursday afternoon with 22 entries and five advancing to the jump-off. Three competitors jumped double clear and Cloe Hymowitz of New York, NY, had the fast time of 29.876 seconds aboard Bon Vivant for the win. The pair was presented the Beagle Brook Farm Perpetual Trophy. Sima Morgello and Zopala placed second in 32.500 seconds. Third place honors went to Lauren Fischer and Norton de la Sapaie in 37.094 seconds. Hymowitz purchased Bon Vivant, a 12-year-old Belgian Warmblood gelding by Sire Major de la Cour, a year and a half ago. The pair has had success showing in North America and abroad this year, including a win in the CSI2* Longines Global Champions Tour competition in Vienna, Austria. 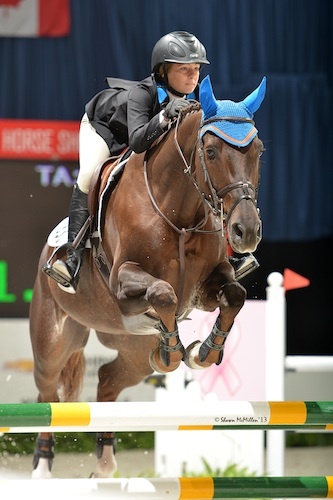 Hymowitz showed in the Children's Jumpers at WIHS in 2012 and just moved up to the Low Juniors this season. Bon Vivant is an experienced mount that has taught the rider quickly and helped her move up the ranks with the guidance of trainers Scott Stewart and Ken Berkley. The High Junior/Amateur-Owner Jumper jump-off class, sponsored by Ellen and Daniel Crown, was held during the evening session with a win for Charlotte Jacobs of East Aurora, NY, riding Kachina. The pair was awarded The “Footloose” Perpetual Trophy in remembrance of Ruth Ellen Wilmot, donated by The Curtin Family in honor of 1990 winner “Footloose”, who was ridden by Caroline Curtin. Twenty-two entries showed over Palacios' first round course and only three were able to jump clear to advance to the jump-off. Lucas Porter and Sleepy P Ranch LLC's Patriot were the trailblazers and finished the short course with four faults in 27.598 seconds to place third. Catherine Tyree and Wetter were next to jump off and also incurred four faults and placed second with a faster time of 27.278 seconds. Last to go, Jacobs knew that she could win with a clear round and that is exactly what she did, stopping the clock in 29.080 seconds. Jacobs went first in round one aboard Candy Tribble and Windsor Show Stables' Promised Land and was able to get a good feel for the course. She then jumped a clear round with Kachina, a 15-year-old Selle Francais mare by Voltaire, to make it into the jump-off. “I can always rely on her because she can always jump a clear round, and I know she is always going to try her hardest,” Jacobs said of the mare. The biggest challenge was Kachina's large size in the small arena, but she handled it easily. An added bonus to the evening's win was getting to show in front of the enthusiastic Barn Night crowd. Although many of the horses in this division are not used to a packed arena, Jacobs' horses both dealt with it perfectly and she enjoyed the excitement. The Washington International Horse Show continues tomorrow with the championships for the Junior Hunter divisions as well as the hunter phase for the Hermès WIHS Equitation Classic Finals. The Low and High Junior/Amateur-Owner Jumpers will have speed classes in the afternoon session. The evening session begins with a $50,000 Faults Converted Speed Final followed by an exhibition from the U.S. Army's Caisson Platoon military horses and an impressive performance by the United States Marine Corps Silent Drill Platoon. The night closes with the $25,000 Puissance, presenting The Armed Forces Cup, sponsored by The Boeing Company. Congratulations to all of our barn night winners! 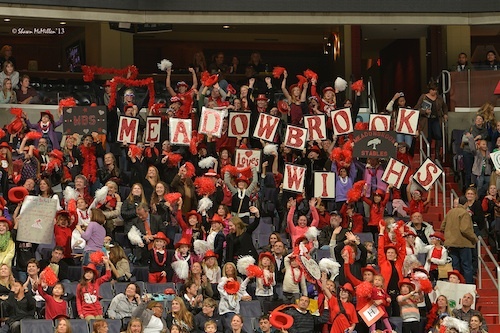 Largest Group Overall winners, Meadowbrook Stables. For those who cannot make it to the show, it will be live streamed in its entirety at www.wihs.org, and is also available on USEF Network at www.usefnetwork.com. The Washington International Horse Show Silent Auction is now available online with an easy-to-use bidding website. Don't miss your chance to win special items that range from a private riding lesson with Olympic gold medalist Beezie Madden to a Private Decorating Party at Georgetown Cupcake Lab. Other incredible items include two tickets to SaturdayNight Live's live show, a diamond horseshoe pin from Tiny Jewel Box, full show attire from The Saddlery, and much, much more. Bid from your computer or smart phone at home, at the barn, at work, or anywhere you have Internet - just go to http://wihs.maestroweb.com. The Acela Club on the Sky Box level of Verizon Center is the perfect place to socialize with friends and a wonderful vantage point for watching the action in the ring. WIHS is hosting three special social events and we hope you’ll join us! Have fun, watch great sport and support worthy local organizations. Party tickets include dinner and an open bar. $150/per person. Order by phone at 202-525-3679 or visit http://www.wihs.org/social-events/. The Armed Forces Cup Reception will be featured from 7-10 p.m. on Friday featuring the launch of “Healthy Stables by Design" by John Blackburn to benefit five local therapeutic riding centers assisting military veterans: Northern Virginia Therapeutic Riding Program, Maryland Therapeutic Riding, Therapeutic Riding and Recreation Center, Loudoun Therapeutic Riding and Caisson Platoon Equine Assisted Therapy Program. The President's Cup Party, presented by Washington Life, will run from 6:30-10 p.m. on Saturday night. 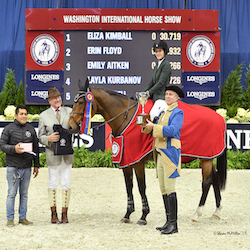 Wear your best equestrian chic and honor Washington's diplomatic community with presenting partner, Washington Life. Along with six days of world-class competition, WIHS features a unique boutique shopping experience for exhibitors and spectators alike. The main concourse at Verizon Center brings together a diverse group of vendors for everyone’s shopping enjoyment. Shoppers can find everything from equestrian tack and apparel to fine art and jewelry. This year's show features over 50 vendor stands and boutiques for all of your shopping needs throughout the week.